Project: Stash: Did Someone Say Knitalong? I've missed knitting along with my Project: Stash Ravelry group so while I've been busy with my other works-in-progress, I've also been designing a new hat for a charity KAL that I'll be announcing ... very, very soon. What I can tell you today is that I'm working with the most scrumptious yarn in the most soothing colorway. This is Duck Duck Wool's Teal Tuesday colorway in the DK weight base, and I can't say enough wonderful things about Sandra's work. She's such a talent: she's smart, funny, generous, and knows her way around a dye pot! 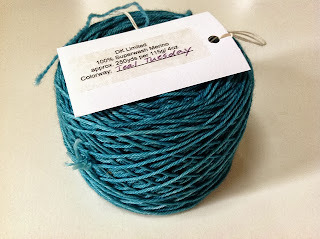 Last spring, Sandra sent this skein along to me as a surprise and I haven't stopped thinking about it ever since. My new hat design was completely influenced by the texture and color of this yarn, and I'm really excited to share it with you in a few days. For now, consider joining our group of fun and supportive knitters and get ready for a fun and prize-filled charity hat KAL. 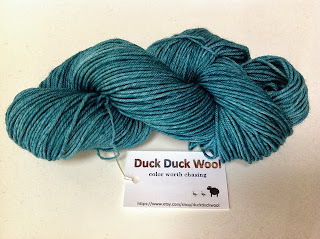 Duck Duck Wool will be one of the sponsors offering a nice incentive to join in and I'll reveal that information in the coming days, too. Gosh, I'm such a tease! Oooo, I can see the depth in this colorway/yarn. Can't wait to see your reveal and charity KAL! Can't wait to see the new hat design! I had so much fun knitting your last charity hat. Will try to join in on the KAL this time, too. That is one pretty teal! Can't wait to see your design. Such a great colour!! I'm keen to get my hands on some of Sandra's yarn - can't wait to see what you come up with! Cannot wait to see your design! I just know it will be fabulous--and lucky me, I can knit it right away as I have been known to hijack a skein or two on its way to the shop :).